Built by the British in 1601 and expanded to its present star-shaped form in the 1620s, Elizabeth Fort has stood witness to many turbulent periods of Cork history. Originally serving as a military barracks, this fort later functioned as a police station before 2014 when the city embarked on a plan to turn it into a tourist attraction. Part of the historic defenses of Cork, Elizabeth Fort is frequently seen on walking tours of the city, alongside other key sights, such as St. Fin Barre’s Cathedral, the Queen’s Old Castle, and St. Anne’s Church. Visitors may wander around the fort independently, pose for photographs at the stocks or with model soldiers, and take in the excellent views of the city from the fort’s walls. Guided tours take place daily. Elizabeth Fort is a must for history and military enthusiasts. Bring a camera to capture photographs of Cork from the ramparts. The fort is not accessible for wheelchair users. Elizabeth Fort sits on Barrack Street in central Cork, and is easily accessible on foot. The fort is about five minutes’ walk from Saint Fin Barre’s Cathedral, and less than 10 minutes from St. Patrick’s Street and the English Market. Elizabeth Fort is open daily, but hours are more limited on Sundays. It’s busiest, though rarely crowded, during the summer. Tours take place at 1pm and are on a first-come first-served basis. For travelers who are interested in military history, Charles Fort in Kinsale—about 30 minutes’ drive south of Cork—is a must. Another star-shaped fort dating back to the 17th century, Charles Fort is significantly larger than Elizabeth Fort. 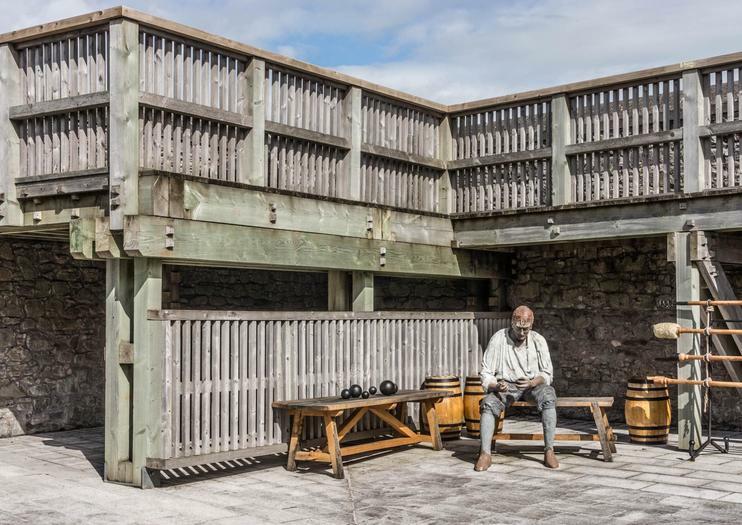 Inside, visitors can view exhibits depicting the daily lives of soldiers stationed here, explore 18th and 19th-century ruins, and admire stunning views of Kinsale Harbour.